a split rail fence system is the simplest fencing solution. Post and rail fences have the stereotypical look of a country fence, but they’re more than just nice to look at; they’re sturdy, durable, and easy to repair, making a split rail fencing a great solution for any Minnesota farm or home, or business owner. 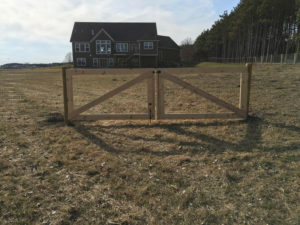 At Twin Cities Fence, we’ll install wooden split rail fences or vinyl post and rail fences so that you can have the material and design you want to make your property stand out but still have a functional fence that meets your needs, farming or otherwise. Wooden cattle fences are the epitome of farming fences. They’re what you probably imagine when you think of farm fencing, and they’re likely the first option you’d consider when you’re looking for a fence on your ranch, farm, or even in your front yard to get that rustic feel. If you’re thinking of investing in a wooden post and rail fence, though, you should be sure that you know the benefits and disadvantages of having a wooden farm fence. For starters, the look of wood gives a wooden split rail fence the look of a genuine traditional farm fence like you’ve seen around farms for generations. These fences are affordable, and they’re easy to repair if anything goes wrong. Depending on your skill with a hammer and nail, you might even be able to repair your wooden fence yourself, in a pinch. A wooden fence will serve your needs well, protecting livestock from breaking free from your property or even just creating property boundaries. Like all wooden fencing systems, wooden split rail fences aren’t as sturdy as some other materials available for farming fences. Especially in Minnesota, where the weather is variable, wood has a tendency to warp and rot over time, which means that wood may not be the best option. If you’re looking for a longer-lasting farm fence, consider investing more in a more expensive farm fencing material, such as vinyl. You may see vinyl post and rail fences lining farms and ranches these days, a newer alternative to wooden split rail fencing. Vinyl has the advantage over wood of being more modern and longer-lasting, as long as it doesn’t encounter too many harsh hail storms. Vinyl is another fencing material that can be used for livestock fencing and split rail fencing along property lines, and it’s able to maintain its color despite any weather it may see with proper cleaning. Vinyl does not decompose like wood, it’s rust-free, and it’s more flexible than wood so that it doesn’t snap or break; all of this means that you don’t have to worry about a vinyl split rail fence breaking down in quality or looks. Because of this, vinyl makes for exceptionally low-maintenance cattle fences, perfect for farms, where every day brings enough hard work already. Vinyl is not as affordable as wood, and in fact, it’s one of the most expensive fencing materials available. In addition, although one of the only things that can threaten a vinyl fence is excessive force, if your fence is storm-damaged or damaged by your livestock, it can be more difficult and more expensive to fix that a wooden fence. Farming fences can be as useful or decorative as you’d like, as durable and long-lasting as you need, and as cheap or expensive as your budget will allow. The beauty of using Twin Cities Fence is that we’ll give you all of your options, show you the advantages and disadvantages of each of these options, and install whatever farm fencing you choose. 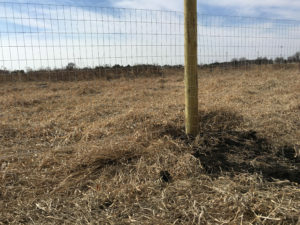 Whether you’re in need of a commercial split-rail fencing system to outline your property or create walkways, a farming livestock fence to keep your cattle from graving on your neighbors’ pastures, or even just a ranch-style fence for your Minnesota home, we have the best fencing materials available, installed by skilled fencing installation experts. To find out more about our vinyl post and rail fences or wood split rail farm fences, give Twin Cities Fence a call today at 612-443-1948, or email contact@tcfmn.com.